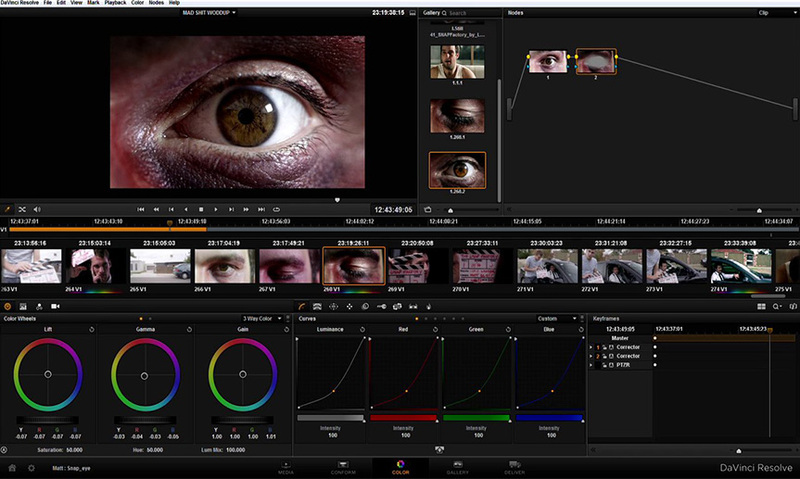 DaVinci Resolve is a fully-fledged color grading program for film and video editing. The software incorporates tools for color correction, professional audio post-production, and video editing in a single application. This powerful finishing application is ideal for editors and colorist looking to deliver Hollywood-caliber outputs. Whether the final destination of your masterpiece is Vimeo, Movie Theater, YouTube, or Quick time movie folder, DaVinci Resolve will handle it with ease. Resolve color corrects moving images and it's a professional level software used worldwide by some of the most demanding storytellers from Tempo block bustar films to cooperate training videos. It is optimised for enhancing and controlling images recorded as digital video files and this amazing professional software is used on feature films, TV shows, Commercials, Live events, Cooperate. DEDICATED COLOR GRADING TOOL SET WITH A STRONG EDITING TOOL SET. Now while Davinci Resolve is optimised for digital color correction but in " Version 12 " it's Editing workflow has been seriously strengthened for all types of projects it can be used for both Non-Linear editing & Color correcting. The name Davinci has been a premium brand name for over three decades, starting out as a film based telecine. HERITAGE & DEVELOPMENT SINCE 1984. They started in 1984 and in 2004 they Launched the software version of there Davinci color corrector and named it Resolve. 01 - Davinci Resolve is Unique besides being designed for color correcting in real time and allowing you to keep much detail in your images as possible, it has a killer feature you won't find any where in other softwares and that is the Collaborative workflow. The collaborative workflow allows a team of editors, assistant editors, Colorists , assistant Colorists to work on the same Resolve project file simultainiously, it is super cool for any project involving a team of creators. 02 - Great Non-Linear editing workflow - Avid, FCP , Premiere. Resolve also has the strongest XML or timeline intergration between non-linear editing systems you won't find any where. 03 - Davinci Resolve is independent & Scalable, meaning that as you start working on bigger projects with more demanding frame size, frame rates, Codecs you can throw more hardware at it and mentain your real - time interaction. 04 - High - end motion tracker. 06 - It's a 32 - bit float Processing software. 07 - Davinci Resolve can be used as a stand alone non-linear editor and ofcourse in a dedicated color suite and it's been put to use where ever image management is important. Davinci Resolve is a mature product of huge collection individual color correction filters organised into a single interface and it's optimised to make quick look of color correction tasks. Davinci Resolve is a node based system tool set. Please follow this link to know more about this software in our Advanced Color Grading Course with Davinci Resolve. Proline Film Academy was created to provide & Support the youths a new level of film education to students training to work in the industry, whether as Directors, Writers, Producers, Cinematographers or any of the many different and challenging crew roles involved in the production of major motion pictures. ( East Africa ), Katwe Road, Byandala Building.